Mother's Day favorite: The prime rib at Martinsdale's Crazy Mountain Inn. Martinsdale's Crazy Mountain Inn: It's been a refuge for hungry travelers in central Montana since 1901. Peter and Cheryl Marchi have owned the Crazy Mountain Inn for 27 years, making them the Inn's longest-tenured owners. 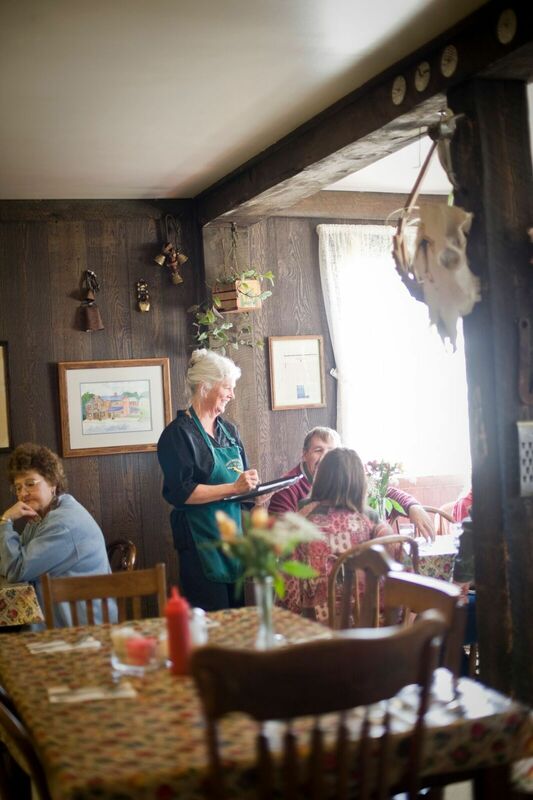 Fresh flowers, oilcloth tablecloths and friendly service greet diners at the Crazy Mountain Inn. Cheryl Marchi's cinnamon rolls, fresh from the oven, make mornings sweeter at the Crazy Mountain Inn. The Crazy Mountain Inn: Comfortable, informal and welcoming. The Crazy Mountain Inn's overnight guests share this communal bath. 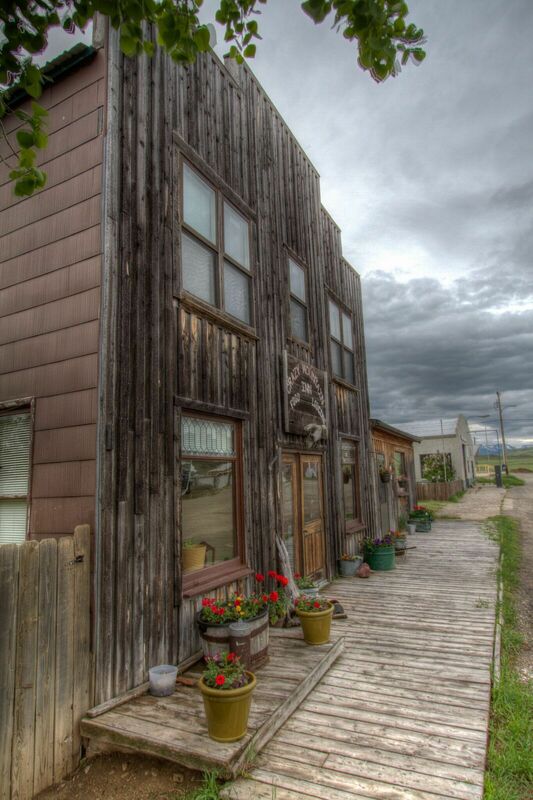 I always choose going on a road trip to celebrate Mother’s Day, and I usually pick a route that enables us to stop and eat at the Crazy Mountain Inn in Martinsdale. The drive to the historic small town nestled between the Castle Mountains, Crazies and Little Belts is picturesque no matter which route you take to get there. My stomach is always growling by the time our bumper hits the board sidewalk out front. Inside, a toasty fire crackles in the lobby’s wood stove. Light filters through lace curtains and the wooden floor creaks as owner Cheryl Marchi, hair twisted into her trademark braids, greets us with menus. Reservations are required on Mother’s Day, and our family usually picks a table on the bright, plant-filled lobby near the fire, where we can stretch out a little more with the kids. The couple bought the business in 1990 and raised their five children, who now range in age from age 29-36, on premises for 17 years before moving to a country home. Currently in their 27th year, they’ve run it longer than any previous proprietor — which at one point even included the Kessler Brewing Company in Helena. I just love the lobby’s high ceilings, bead-board walls and antique furniture, but the café side, with its dark wood walls, long counter and oilcloth tablecloths, is nice too. The inn usually seats 28 people, but they pull out a couple extra tables on Mother’s Day and top them with fresh flowers. “The most we’ve ever served on Mother’s Day is 150,” states Cheryl, who rounds up extra wait staff for the special occasion. “My family knows — if they’re around on Mother’s Day, they’re working." Cheryl runs the inn alone these days now that Peter’s job as chief water commissioner for the Musselshell River keeps him occupied. But he’s always back in the kitchen slingin’ it with Cheryl on Mother’s day, often stepping out to help servers top off wine glasses or help deliver icy bottles of Moose Drool and Trout Slayer. Mother’s Day Specials come with vegetable and homemade roll with choice of soup or salad. This year’s entrees include a good old-fashioned favorite: Prime Rib served with au jus and horseradish and baked potato ($24); Poached Shrimp with baked potato ($23); Shrimp Sautéed with Lemon and Garlic over rice ($24); and Deep Fried Fantail Shrimp with choice of potato ($16.25). They’ll also offer a limited number of items from their regular menu — basics like their trademark Chicken Fried Steak — but not all sandwiches and burgers. Homemade desserts on Mother’s Day will be Sour Cream Lemon Pie (voted Best Pie in Montana in 2005 by Montana Magazine readers), Sour Cream Banana Pie, Rhubarb Pie, Peanut Butter Pie, Cheesecake with Strawberry or Raspberry, Mixed Berry Pie, Chocolate Cake, Apple Pie, Chocolate Mousse and Ice Cream Sundaes. In the summertime, Cheryl always lists Sour Cream Lemon, Peanut Butter, Rhubarb, Banana Cream and at least one berry pie on her chalkboard and makes homemade cinnamon rolls and muffins as often as she can get around to it. Her menu is full of great sandwiches and burgers and breakfast items like quiche. She makes Fish Tacos on many Fridays and also does one annual Thai Night sometime between June and September — whenever her 70-year-old cook, originally from Thailand, can fit it in. “I only advertise it on Facebook, and we serve just one dish.” Past entrees have included Green Curry, Pad Thai and Red Curry. After eating, it’s fun to wander upstairs and check out the second floor, where 11 sunny guest rooms flank the long hallway. Each is outfitted with an antique bed (or beds) and desk and shares a large communal bathroom that has a claw foot tub and shower. Elizabeth Guheen, curator of the Bair Family Museum, says "The visitors to the Bair Museum love their Crazy Mountain Inn "experience." We like to kick around town (there’s a really cool old jail near the Inn that looks like a Medieval torture chamber) and let the kids throw rocks in Martinsdale Reservoir before heading home to catch the Mother’s Day caddis hatch on the Yellowstone River. We usually go to Pig Farm fishing access east of Livingston. Dan makes a few casts, our Jack Russell chases marmots down holes, the kids check out caddis on rocks (and laugh as they crawl up their legs). Then one of them wades out too far and ends up with drenched jeans, removing them before we can intervene. I just sit back and frame it all up in the viewfinder. Now that’s my idea of a perfect Mother’s Day! Scald milk and add butter to it to melt. Let this mixture cool and then add the salt and eggs. In a large bowl add ¼ cup warm water and honey. Sprinkle the yeast on top and let it sit until it gets foamy. When the milk mixture has cooled to lukewarm, add it to the water/honey/yeast mixture. Add flour 1 cup at a time, kneading after each additional cup, until dough starts to pull away from the bowl. Then knead dough on a well-floured surface until smooth and elastic. Grease your bowl and put the dough back in, cover and let rise until dough doubles in size. Punch down and roll into a rectangle. Brush with melted butter and sprinkle with ½ cup sugar and 2-3 teaspoons cinnamon. Roll the rectangle up length-wise and pinch edges together. Cut this roll in half, and then cut each half into six slices. Icing: Mix 1 cup confectioner’s sugar with a drop of vanilla and enough milk to make it drizzle. Montana-based photojournalist Lynn Donaldson-Vermillion shoots and writes for Travel + Leisure, FoodNetwork.com, is an official Instagrammer for National Geographic Traveler, and contributes regularly to the New York Times. She is founder and Creative Director of the Montana food + travel blog, TheLastBestPlates.com. They ONLY accept cash or checks. NO CREDIT CARDS! Mother's Day: On Mothers Day, reservations required and hours are 10 a.m. to 7:30 p.m., with brunch being served from 11:30 to 7:30. May’s regular hours are Thursday 10-4, Friday-Sunday 10-7:30. June-September hours are Wednesday-Thursday 10-4; Friday-Sunday 10-7:30. Accommodations: The inn has 11 rooms with 17 beds total. One person/one bed is $47, two people/one bed is $57, 2 people/2 beds is $65. $5 for each additional person and $5 per dog with a $25 refundable deposit for pets. A 7% bed tax is also added. The hotel is open 7 days a week May-November, and they do their best to provide meals for guests on the days the cafe is closed — with advance notice.